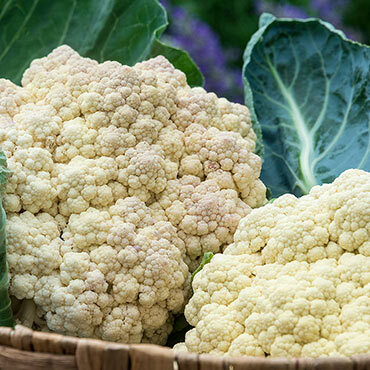 This hybrid cauliflower shows unusual seedling vigor, and likes being planted in deep, rich, well-drained soil in full sunlight in the spring and fall. Snow Crown produces good-quality, medium-sized heads whether harvested in summer or fall, with a good tolerance to moderate fall frost. This variety maintains its prime eating quality for up to 10 days in the garden. Roast and blend into vegetable stock for a delicious soup, or slice slabs of cauliflower from the center and saute on the stovetop for gorgeously browned cauliflower steak! No sprays are required to control common garden pests or protect against disease. 55 days to maturity.